Miss Manson was associated with the Bell Murray family for many years. Major Bell Murray stated in 1928 that Miss Manson had been his wife's longest standing friend for 18 years, which would date the commencement of their friendship to around 1910. The first of the Bell-Murrays three children, Mary, was born in Muree, India in 1908. We are not sure where or when Miss Manson and Mrs Bell-Murray originally met (India or England) but we do know that on 28 April 1916 Miss Manson and Mrs G Bell Murray and three children aged (7) (5) (4) sailed from London to Bombay, India on the SS Medina. So, the inference is that Mrs Bell-Murray and Miss Manson began their friendship sometime prior to 1916, likely several years earlier. Miss Manson and the Bell-Murrays lived in the same house(s) for most of their lives, a measure of the endearing nature of the friendship. There appears to be an interval in this sharing a residence during the early to mid 1930's. From the early 1930's Miss Manson was living in London and working for Lady Domville, Wife of Sir Cecil Domville, as a Governess, Miss Manson held this position until around 1934. We found an amusing story about Miss Manson's time with Lady Domvile - In July 1932 Lady Domville remarried (following the death of her first husband Sir Cecil). Miss Manson and the Chauffeur were responsible for delivering the Domville daughters (bridesmaids) to their mother's wedding at the church in Kensington, west London. Unfortunately, the Chauffeur did not know London so well and in error drove them to a church in Paddington (further west-central London) a few miles away. Ironically, perhaps, some years later, Miss Manson would reside in Craven Hill (adjacent to Paddington, London). Following Mrs Bell-Murray's death, the Major moved to London in 1954 and once again shared the same address as Miss Manson. A year later the Major died at the age of 72. Miss Manson would eventually move again within London - this time to Hounslow, where she died in 1980 at the age of 88. Readers are probably aware that Major Bell Murray, upon his return to the UK , established his kennels in Scotland in 1921 on a large house and estate that he rented from his cousin and which was known as "Cove House". Major and Mrs Bell Murray, their children and Miss Jean Manson all lived at Cove house. Major Bell Murray never registered or used a kennel name/affix. His breedings were registered with simple names such as Pushum, Ooty etc. In 1924 Major Bell Murray transferred all his Afghan hounds to Miss Jean Manson who adopted the name "Cove" for her kennel name. From this time on, all the Afghan hounds bred at Cove were registered in Miss Manson's name as breeder and carried her "Cove" kennel name. "It is to him (Major Bell-Murray) that English fans are liable for the introduction and admission of the Afghan greyhound in Britain". Mr Chauvet was clearly in the Ghazni camp, and indeed he shared Mary Amps criticism of the Bell-Murray hounds, Noting Mr Chauvet's views and preferences on type, we were pleasently surprised by his generous acknowledgement of the importance of the Bell-Murray hounds in getting the KC to approve the breed in 1926. Mr Chauvet informs us, that as of 1926 in England the official recognition of a breed of dogs was possible only under very strict conditions. In particular, it was necessary that the number of Afghan hounds registered numbered at least 80 and that this minimum number of "registrations" covers a 4 year period. In addition, no "challenge certificate" were issued unless at least 20 of the newly recognized breed have been registered during the previous year. Further we would add to Mr Chauvets summary of KC requirements that the KC also required a breed standard (The Afghan Hound Club breed standard existed which reflected the Bell-Murray type). A breed club ( AHC) already existed. So by 1926 thanks almost entirely to Bell-Murray registrations the existnce of the, AHC breed standard andthe AHC breed club thus satisfied the KC's requiremen, and the breed was duly recognized and given its own breed classification at KC shows. AHT does not know what the AKC new breed recognition requirement were in 1926, The AKC requirements appear to be more relaxed than the KC'S. At the time that AKC recognized the breed there was no breed or parent club. Breed activists and, enthusiasts had adopted a customised version of the English AHC breed standard, In the period 1920 - 1929 there were a total of 10 Afghan hound registrations recorded at the AKC (9 of these registrations were of Bell-Murray lineage breeding). So the number of registrations didn't seem to be as major a criteria as it was in England. 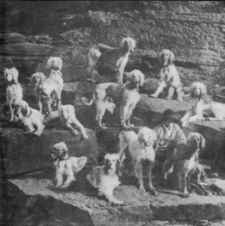 The wealthy enthusiast Clarence Dillon (Dunwalk) imported 10 hounds from Jean Manson, (he registered only 4 of them), All of the first 9 AKC registrations were of Bell-Murray lineage breeding). The AHC website states "In 1926 - presumably at the urging of those who became the first registrants - the American Kennel Club opened its Stud Book to Afghan Hounds and adopted a brief, descriptive standard from British sources." O'Valley Farm Afghan hounds bred a litter in October 1927 whch has the distinction of being the first US bred Afghan hound registered with the AKC. We only have details of one from the litter -" Faida O'Valley Farm" (Shiek x Zun O'Valley Farm) which was a pure Bell-Murray lineage breeding. So Bell-Murray have the distinction of their lineage being the breeders of the first Afghan hounds registered in the USA and also their bloodlines produced the first homebred Afghan hound registered in the USA. From the mid/late 1920's as Major Bell-Murray gradually withdrew from breeding, Miss Manson took up the reins and continued the Bell-Murray legacy and lineage via her Cove Afghan hound breeding. Cove hounds were exported to several European countries as well as the USA which she famously visited 1926, taking with her a dozen Afghan houndsr, andthus introducing and promoting the breed to the American public Press reports of her visit were syndicated and transmitted via wire across the entirity of the USA. The breeds first attendance at Westminster Kennel Club show occured in 1927 and included Cove bred Afghan hounds. Miss Manson also wrote an article for the American Kennel Club Gazette in 1929 entitled "The Dog Of The Mystic East" which further helped promote interest and awareness in the new breed throughout the USA. "It is to her (Miss Jean Manson) that American fans are liable for the introduction and admission of the Afghan greyhound in the USA". Ch Ranee, Kanee and the other littermate Straker were by Rajah x Begum and were all born in Afghanistan on 5th March 1919. Breeder was Major Bell-Murray but ownership of Ranee and Kanee (and possibly Straker) were transferred from Major Bell Murray to Miss Manson in December 1924. From the mid 1920's Miss Manson became increasingly visible in dogdom as the primary interface for the Bell Murray hounds. Miss Manson famously visited the USA taking a dozen Afghan hounds with her, and introducing the breed to the American public. 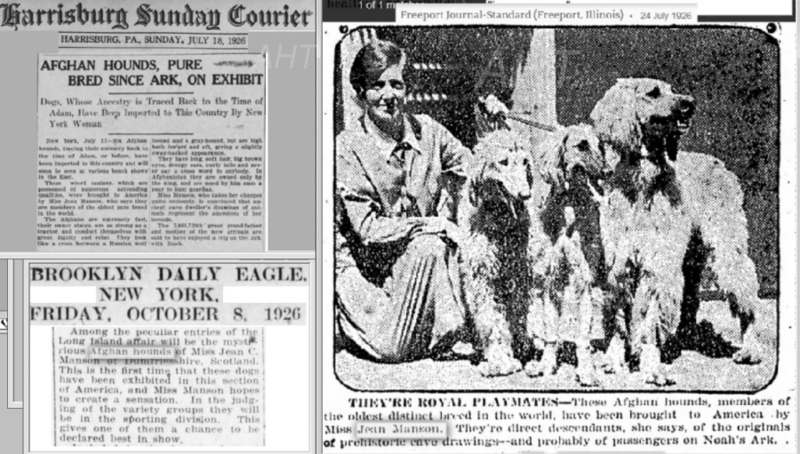 The breeds first attendance at Westminster Kennel Club show in 1927 included Cove bred Afghan hounds.. Miss Manson also wrote an article for the American Kennel Club Gazette in 1929 entitled "The Dog Of The Mystic East" , which helped introduce and promote the new breed in the USA, (a link to the article is at the bottom of this page).